Bhimrao Ramji Ambedkar popularly known as Baba Saheb, was an Indian jurist, economist, politician and social reformer who inspired the Dalit Buddhist Movement and campaigned against social discrimination against Untouchables (Dalits), while also supporting the rights of women and labour. He was Independent India’s first law minister, the principal architect of the Constitution of India and a founding father of the Republic of India. 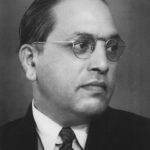 Ambedkar was a prolific student, earning doctorates in economics from both Columbia University and the London School of Economics, and gained a reputation as a scholar for his research in law, economics and political science. In his early career he was an economist, professor, and lawyer. "A people and their religion must be judged by social standards based on social ethics. No other standard would have any meaning if religion is held to be necessary good for the well-being of the people." "Life should be great rather than long."